I made Creamy Artichoke Soup for dinner on Wednesday and everyone wanted the recipe, so here it is. It’s based on a recipe that I found on the Food Network site, but I’ve changed it a little bit. Heat olive oil in a heavy stock pot over medium heat. Add the onion and the garlic and stir. Add the potatoes and cook for 5 minutes, stirring often. Add the artichokes, stock, salt, pepper, and bay leaves and cook until the vegetables are tender, about 20 minutes. When done remove the bay leaves. Using a blender, puree the soup in batches. Ladle the soup into serving bowls and enjoy. I sometimes serve this soup with a small dollop of greek yogurt and chives added to the center of the bowl just before serving. 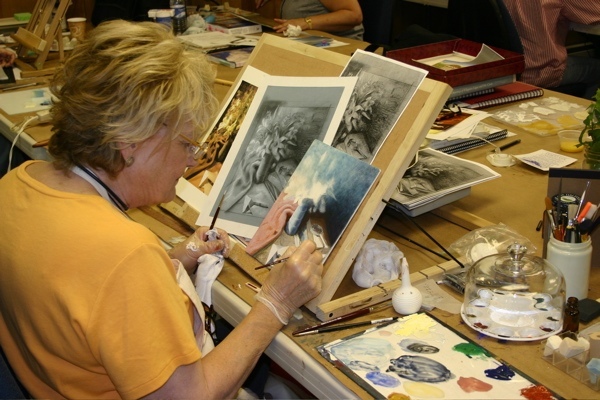 Today is the final day of the 5-day workshop with Koo Schadler. 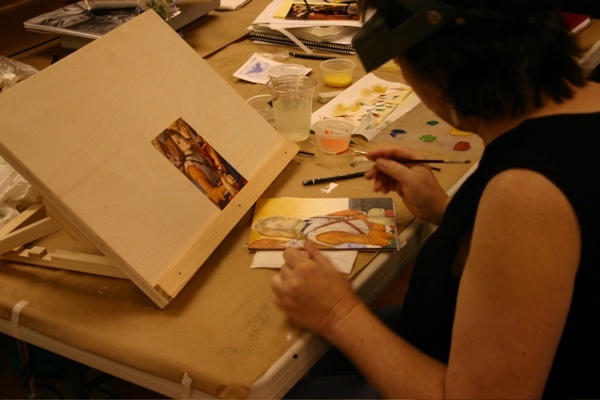 Koo is an exceptional artist and instructor in egg tempera. She has written a highly regarded book on the subject and is a wealth of information about all the technical details of painting with this media of the Renaissance masters. Koo arrived early on Sunday before the students started to arrive so that she could set up the studio. 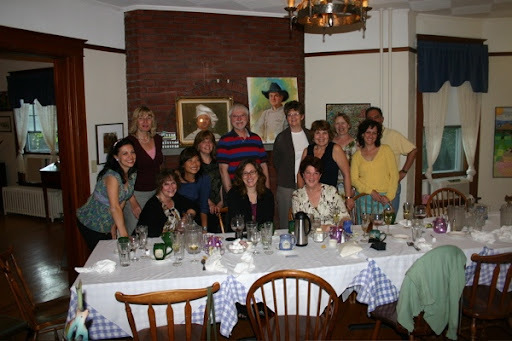 She arranged and covered the tables with paper, and then hung up examples of egg tempera painting all over the walls. This was a full class and everyone was eager to get started. These pictures were taken on Wednesday, but you can see how much progress people are making with this very detail oriented work. This is Barbara Willner. She is using a fabulous tabletop painting easel that Koo sold to those interested. 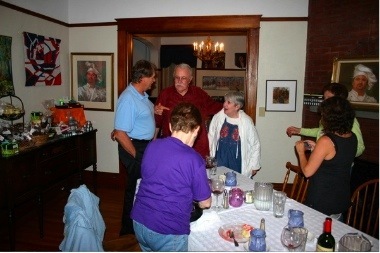 Here is Koo offering advice to Skia Laurence. 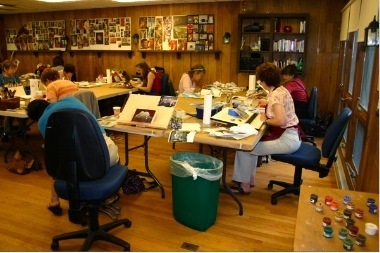 Another view of the class busily working in the studio. 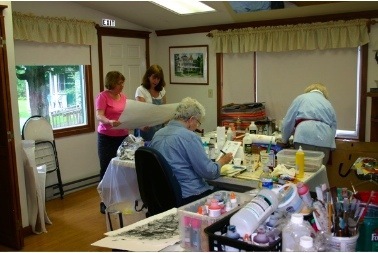 I think many burned the midnight oil during this workshop – taking full advantage of the 24-hour access to the studio. 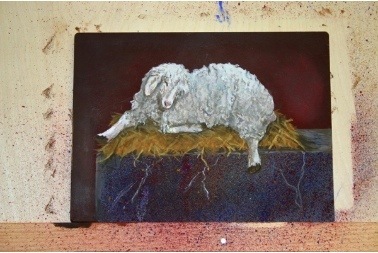 Here is a great sheep painting by Toni Savchuck. It is based on a photograph that Toni took at the Maryland Sheep and Wool Festival. 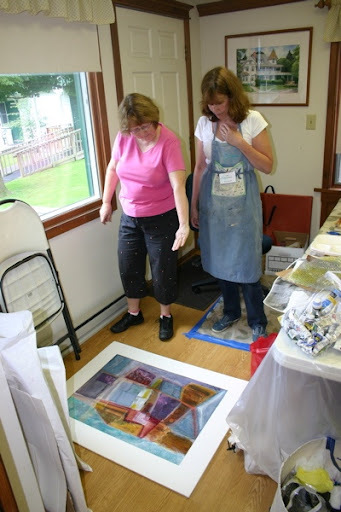 Toni’s mother came along with Toni as a non-participant in the workshop, but Toni says that her mom is having the time of her life hanging out at the inn and visiting with old friends in the area. 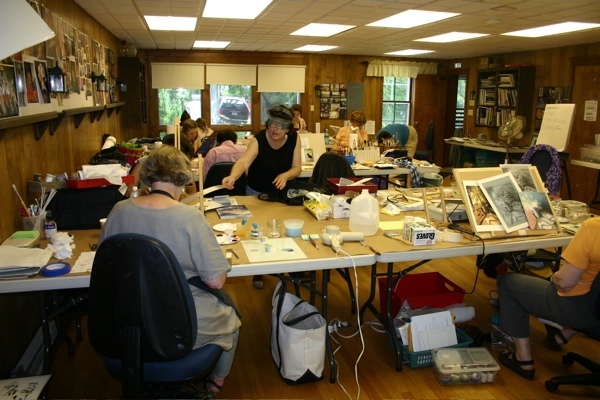 If you missed your chance to get into this fine workshop at the Hudson River Valley Art Workshops, don’t worry Koo will be back again in 2011. Last week just flew by and it was almost gone before I had a moment to take some pictures! 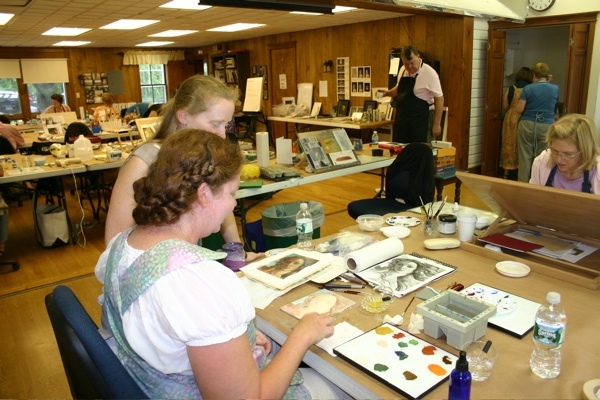 Frank Webb was here at theHudson River Valley Art Workshops teaching his 5-day class on watercolor. Everyone enjoyed working in the studio, but several took advantage of the option of going outside to collect some field sketches and value drawings. Here is Frank and his lovely wife Barbara (one of the nicest couples you’d ever want to meet) in the inn dining rooms on the last night. One of the dessert highlights of the week was the freshly made cherry pie. Mark used Rainier cherries and almond slices in the filling. The made-from-scratch crust includes homemade marizpan. Yumm. Can’t you just about taste it! Last week flew by so quickly I barely had time to snap a few quick pictures of Frank Webb. 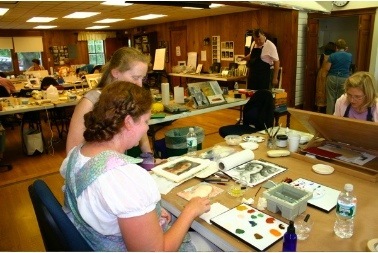 Frank was here at Hudson River Valley Art Workshops teaching a 5-day watercolor workshop. 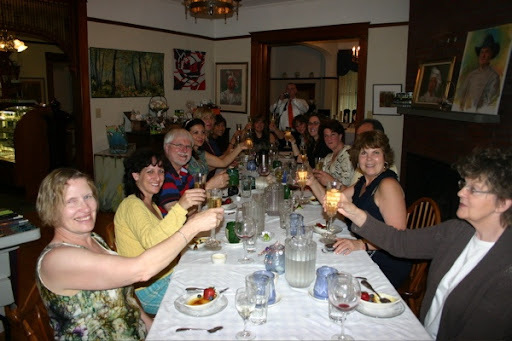 Here is Frank, with his wife Barbara (one of the nicest couples you’d ever want to meet) at the last dinner for the workshop. Everyone was gathering around to get some pictures. 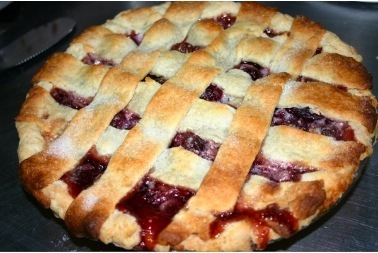 One of the dessert highlights of the week was the freshly made cherry pie! 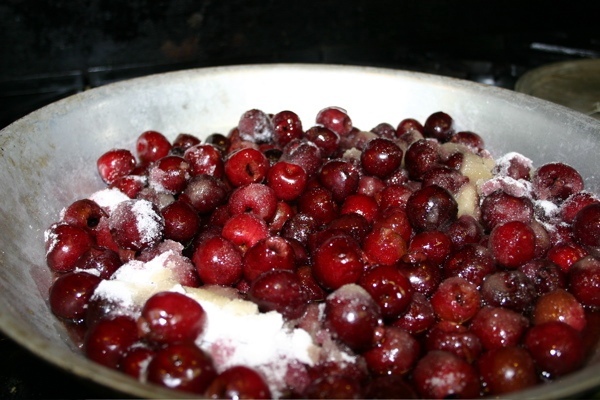 Mark used fresh Rainier cherries and sliced almonds in the filling. And then the made-from-scratch crust included homemade Marzipan. Yumm. Can’t you just taste it! Another week just up and went before I had the chance to blink my eyes! Guess that means I’m having too much fun! We had a wonderful group of artists here this week studying with Karen Rosasco. 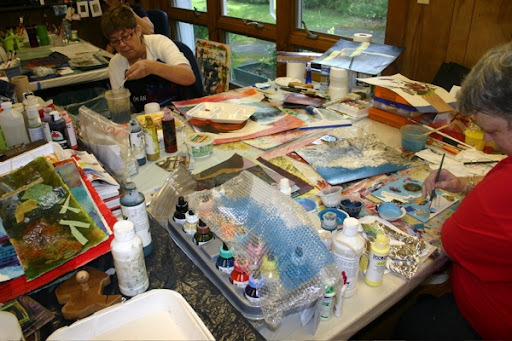 They were creating some amazing work and everyone is disappointed that the week is over and Karen won’t be teaching here next year. But not to worry, we’ll have Karen back as soon as possible. 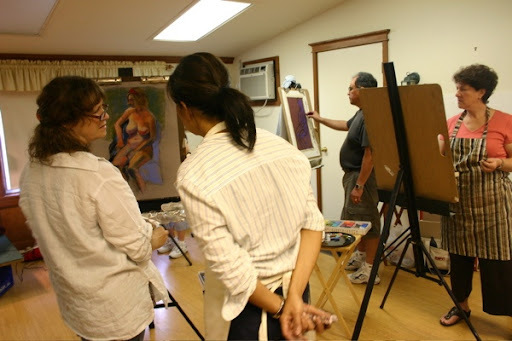 Here are some shots that I took during the workshop. Below is some work done by Denise Schober. 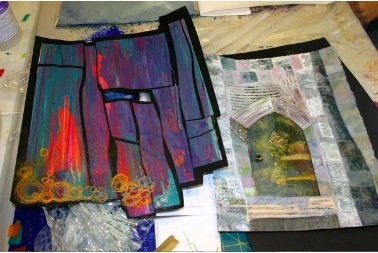 She is a fiber artist and even brought her sewing machine to this class to add a little thread work to the collages. She also impressing people with her embossed batting techniques and Angelina fiber. 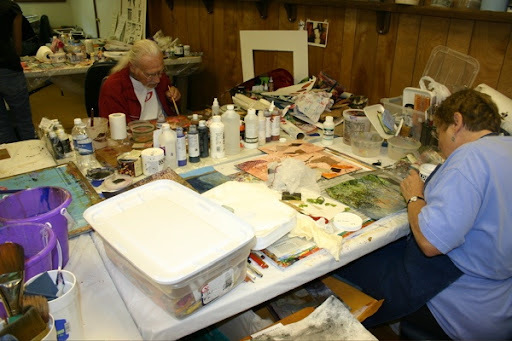 Here are Les and Lil, a couple of frequent workshop participants. It’s always great to see them again. 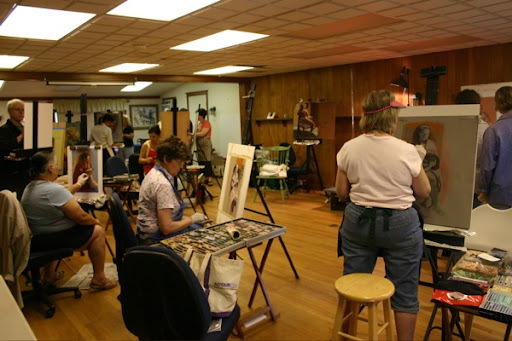 There is Karen (in the pink) giving a little one-on-one critique with Lisa C., who came to the workshop as part of a mother-daughter vacation. Some really creative and expressive work! 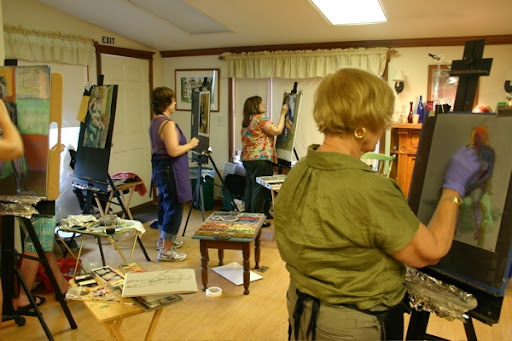 It has been a busy week and I didn’t get to get out to the art studio as often as I would have liked, hence, the shortage of pictures. 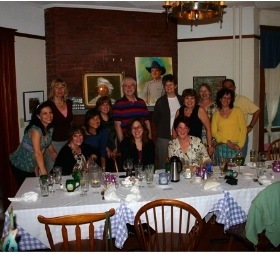 If you weren’t here you missed a tremendous workshop! But if you like working with collage and watermedia, why don’t you sign up for Gerald Brommer’s workshop?! Gerald Brommer has been teaching art for decades and had written more than 30 books on art. 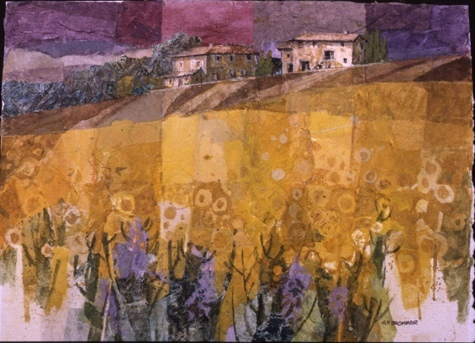 He will be teaching his “Stained Paper and Collage” workshop starting August 2 – 8, 2009. Usually his workshops fill up fast to the max of 20 students, but this year the workshop promises to be a bit smaller — which is good news for his students!! 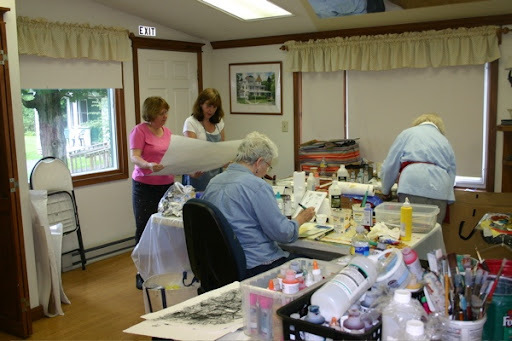 More individual instruction and more pampering at the inn! So why don’t you join us? 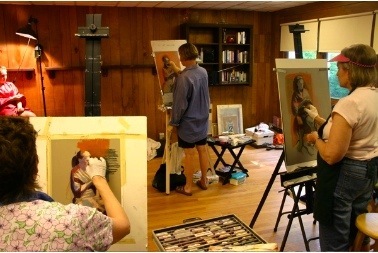 It’s a great opportunity to study with a master. All levels are welcome. This was the first time that Margaret taught at Hudson River Valley Art Workshops, but it certainly won’t be the last. Everyone in the class had wonderful things to say about Margaret, both as an artist and a teacher. Margaret did a demo the first morning, but after that the class got right to working. 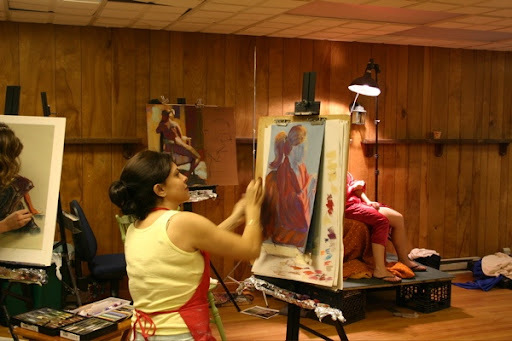 There were 2 models for the class each day and Margaret set a 2 hour limit for each pose. This group really liked to celebrate at dinner time and enjoyed many laughs together! We can’t wait to have Margaret back again. It will potentially be next year, but if not then in 2011! Don’t miss it!